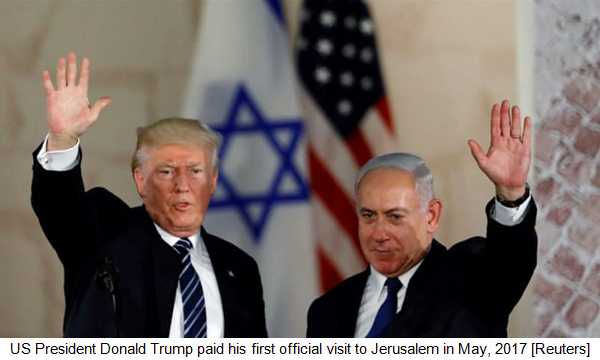 On December 6, 2017, US President Donald Trump announced his decision to recognise Jerusalem as Israel’s capital and added that he was directing the US state department to begin preparations to move the US embassy from Tel Aviv to Jerusalem. 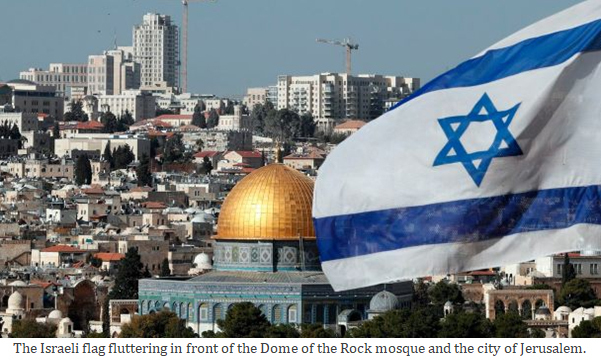 This shocking and provocative move marks an unprecedented departure from the US policy on the Israeli-Palestinian conflict and on the status of Jerusalem and is in clear violation of international law and United Nations resolutions. Mr Trump’s decision to recognise Jerusalem as the capital of Israel, which evidently favours Israel, contains no conditionalities or obligations on Israel to stop its well-orchestrated project of building Jewish colonies in the occupied Palestinian territories. It legitimises Israel’s illegal occupation of East and West Jerusalem and the expansion of illegal Jewish colonies in the occupied Palestinian territories and ignores the Palestinians’ right to have a state of their own. 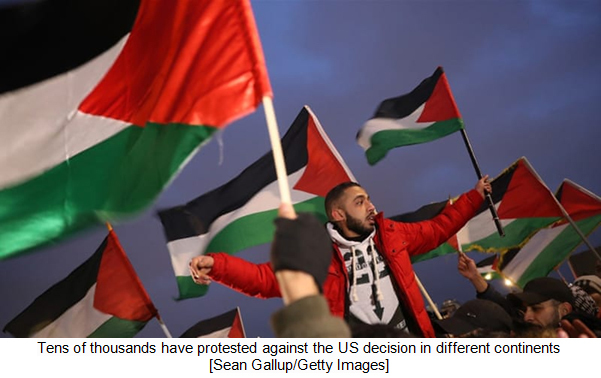 The decision forfeits America’s claim to be a neutral and fair mediator between the Israelis and the Palestinians and severely undermines the prospects for a peaceful solution to the Palestinian-Israeli problem. For all practical purposes, it puts an end to the idea of a two-state solution for the Israeli-Palestinian conflict, which has been the official American goal for the past 25 years. The move is fraught with grave risks for the escalation of large-scale violence in an already volatile region. 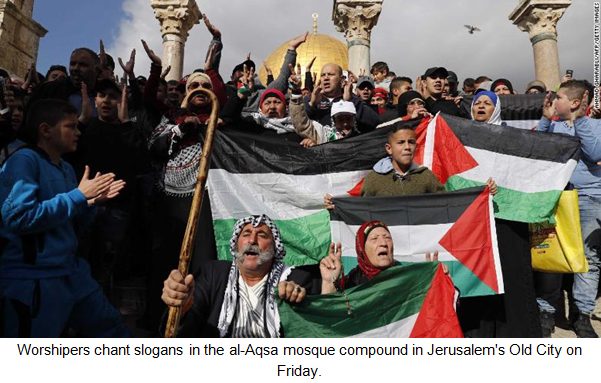 Mr Trump’s announcement is likely to embolden messianic Jewish extremists who want to build a Jewish temple in the Al-Aqsa Mosque complex in the Old City of East Jerusalem. Mr Trump’s decision seems to be motivated by domestic political considerations as well as his well-known right-wing and Islamophobic leanings. The invocation of “Judaeo-Christian United States” is a frequent refrain in his speeches. “We are stopping all attacks on Judaeo-Christian values,” he said in a speech in October 2017. Trump’s announcement marks the fulfilment of his 2016 campaign promise to Jewish donors and a Christmas gift to Evangelicals. His core electoral constituency admires and supports Israel and hates Arabs and Muslims. Mr Trump’s team that advises him on the Israeli-Palestinian issue consists of Jason Greenblatt, Assistant to President Trump, David Friedman, US ambassador to Israel, and his son-in-law Jared Kushner. All the three gentlemen are Jews. David Friedman has links with Israel’s illegal settlement project. Newsweek recently revealed that Jared Kushner failed to disclose his co-directorship of a foundation that funds illegal Jewish colonies in the West Bank when he filed his financial records with the Office of Government Ethics this year. 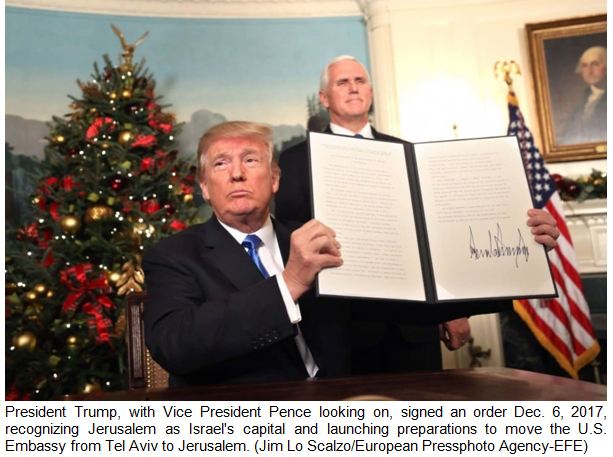 Wealthy American Jews and influential Evangelicals as well as right-wingers in Mr Trump’s cabinet, including Vice President Mike Pence, have lobbied him to recognise Jerusalem as the capital of the Jewish state. Trump’s campaign received substantial funding from hardline American Jewish promoters as well as the Christian Right. Sheldon Anderson, the casino billionaire and a zealous supporter of Israel’s ultra-nationalism, gave $20 million to a political action committee which supported the Trump campaign in 2016. The number of Christian Evangelicals in the United States is estimated to be around 50 million and includes influential politicians like former US president George W. Bush and the current US Vice President Mike Pence, who is considered a darling of the Evangelical movement in the US. The Evangelicals are convinced of the literal truth of Biblical prophecies and see Israel’s supremacy over Jerusalem as a fulfilment of Biblical prophecy. A recent survey found that 82% of white Evangelicals believe that God gave Israel to the Jewish people. An overwhelming majority of Evangelical voters -- over 81% -- voted for Trump in the 2016 elections. In July 2017, Israeli Prime Minister Benjamin Netanyahu told an audience in Washington, “We have no greater friends than Christian supporters of Israel.” The Evangelicals and other right-wing Christian groups are evidently delighted and ecstatic about Trump’s announcement. Predictably, Israel is thrilled by Trump’s decision. Israeli Prime Minister Benjamin Netanyahu praised Trump’s announcement as an “historic landmark” and added that Israel was profoundly grateful to the US President for this move. At a special session of the United Nations General Assembly held on December 21, the overwhelming majority of the world’s nations denounced Donald Trump’s decision to recognise Jerusalem as the capital of Israel. The General Assembly voted 128 to 9, with 35 abstentions, to approve a non-binding resolution, drafted by Turkey and Yemen, demanding that the US rescind its December 6 decision on Jerusalem and the move to shift the US embassy there. Countries that voted in favour of the resolution defied Trump’s threats to cut off aid to countries voting for the resolution. The resolution demanded that all states comply with UN resolutions concerning Jerusalem and called upon them to refrain from establishing diplomatic missions in the disputed city. The vote at the General Assembly has further isolated the US. France has rejected Trump’s unilateral and illegal decision. French President Emmanuel Macron said the move contravenes international law and UN Security Council resolutions. German Chancellor Angela Merkel said Germany would stand by the UN resolutions on the Israeli-Palestinian conflict. “We are sticking to the relevant UN resolutions – they make clear that the status of Jerusalem needs to be negotiated as part of wider negotiations on a two-state solution.” She said. Britain’s Prime Minister Theresa May said her government disagreed with the US decision, which is unhelpful in terms of prospects for peace in the region. She added that Jerusalem should ultimately be shared by Israel and a future Palestinian state. Nobel laureate Desmond Tutu said in a statement: “God is weeping over President Donald Trump’s inflammatory and discriminatory recognition of Jerusalem as the capital of Israel. It is our responsibility to tell Trump that he is wrong. God does not discriminate between the people of various religions and those who claim divine rights for themselves to physical property on earth are false prophets.” The leader of Egypt’s Coptic Church, Pope Tawadros II, cancelled an upcoming meeting with US Vice President Mike Pence, in protest against Washington’s move to make Jerusalem the capital of Israel. 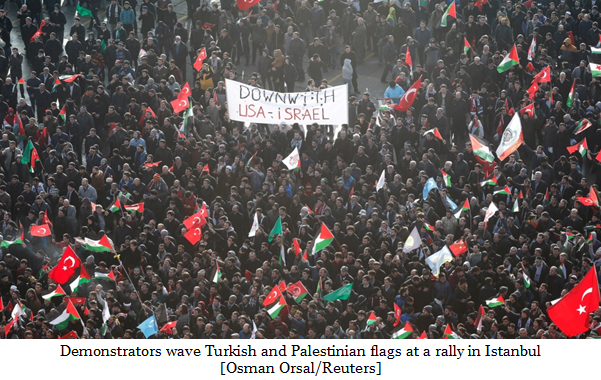 Massive protests were held against the US move across many parts of the Muslim world. 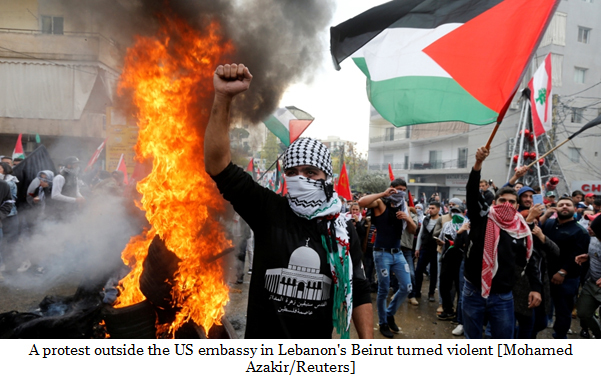 Violence erupted near the US embassy in Beirut on December 10 after large-scale demonstrations by Palestinians. Protesters torched US and Israeli flags on the streets and threw projectiles at security forces. 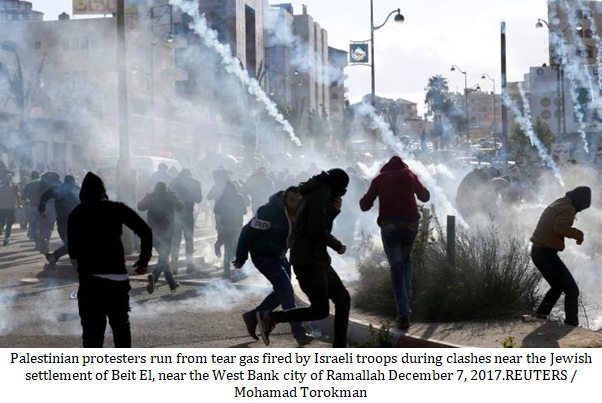 At least 16 Palestinians were wounded in clashes in the occupied West Bank, during protests against US President Donald Trump's recognition of Jerusalem as Israel's capital. Two Palestinians were killed by Israeli forces in Gaza on December 15 as thousands of Palestinians protested in the occupied Palestinian territories over the US move on December 16. Protest rallies were held in many cities around the world on December 16, including Kuala Lumpur and Tokyo. Jerusalem came under the control of the Ottoman Empire in 1517 and remained a part of the Empire until 1917. Faced with rising stigmatization and discrimination and the dwindling prospects of integration into European societies, many Jews began migrating to Palestine in the 1880s. This migration formed part of an emerging political and ethnic movement that came to be known as Zionism. In 1897 the First Zionist Congress held in Basel, Switzerland called for the creation of a Jewish homeland in Palestine, thus spawning the Zionist movement. Following the end of World War I, the British government acquired mandatory power in Palestine in 1920. Soon after acquiring control over Palestine, Britain began to facilitate the immigration of European Jews to Palestine. Spurred by the British promise of the creation of a ‘national homeland’ for the Jewish people in Palestine and the rise of Nazism in Germany in 1933, the Jewish population in Palestine swelled to 368,845 between 1921 and 1945. In Jerusalem alone, the population of Jews rose from 53,000 in 1931 to 70,000 in 1935. The Balfour Declaration and the British support for the creation of an independent Jewish state in Palestine engendered a great deal of resentment and anger among the Palestinians, who formed more than 90% of the population at that time and who had lived in Palestine for centuries. In 1920 the Third Palestine Congress held in Haifa condemned the British government’s support to the establishment of a Jewish state in Palestine and rejected the Balfour Declaration, calling it a blatant violation of international law and the rights of the native Palestinian population. On 29 November 1947, the United Nations recommended the partition of Palestine into two independent states – one for Palestinian Arabs and the other for Jews. David Ben-Gurion, one of the founders of Israel and the first prime minister of the Jewish state, and other Zionist leaders accepted the UN resolution while the Palestinians rejected it. 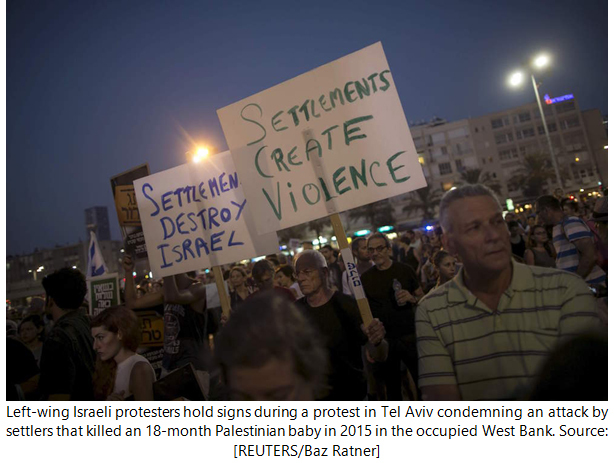 Meanwhile, violent clashes between Palestinians and Jewish immigrants and settlers intensified. On 14 May 1948 David Ben-Gurion announced the establishment of the Jewish state of Israel in Palestine. Approximately, 20,000 out of 27,000 square kilometres of the Palestinian land came under the control of the new state. Only the West Bank and the Gaza Strip remained under the control of, respectively, Jordan and Egypt. In the United Nations Partition Plan for Palestine, Jerusalem was granted special status in view if its sacred character and its enormous religious and cultural importance for Jews, Christians and Muslims and was declared an international city. The Jews accepted this plan and David Ben-Gurion, the founder of Israel and its first prime minister, noted that the loss of Jerusalem as part of sovereign Israel was the “price we have to pay” for the creation of a Jewish state in the rest of the territory. On December 5,1948, Zionist forces took control of West Jerusalem and declared it a part of the Jewish state a week later. During the 1967 war, Israel captured East Jerusalem, which was at that time under Jordanian control. Israel has described Jerusalem as the “eternal and undivided capital of the Jewish state.” The 1993 Oslo Accord led to the creation of an autonomous Palestinian Authority and left the status of Jerusalem as a “final status issue” to be settled in a permanent peace between Israel and the Palestinians. 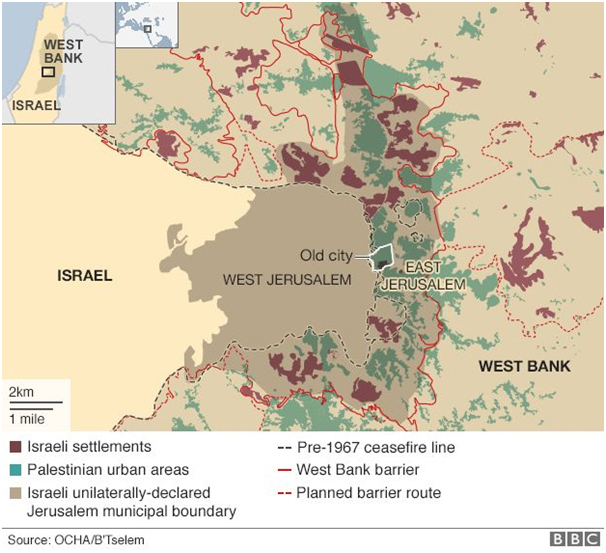 Since 1967, when Israel annexed East Jerusalem, the United States and the international community have rejected as illegal Israel’s attempts to expand Jerusalem’s boundaries b1y constructing a ring of Jewish colonies on occupied Palestinian lands. Over the years, Israel has moved nearly all of its government offices to Jerusalem. Tens of thousands of Jewish colonies have been built in East Jerusalem. United Nations Resolution 242, passed on November 22, 1967, states that Israel must withdraw from the territories it seized in the 1967 war. 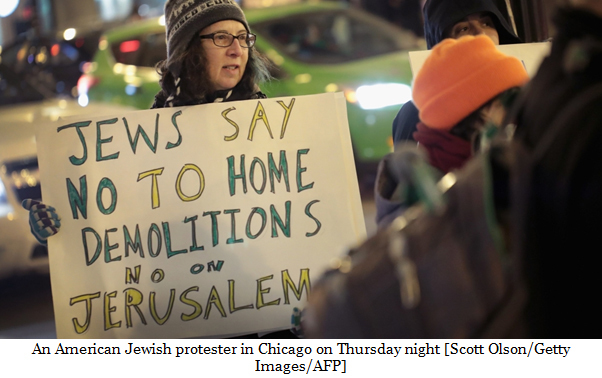 Israel, however, rejected the resolution and has entrenched its occupation of Palestinian territories by evicting Palestinians from their ancestral homes, by demolishing Palestinian homes and by expanding Jewish colonies. Roughly, 11% of Israel’s 6.6 million Jewish population today live on occupied Palestinian lands. 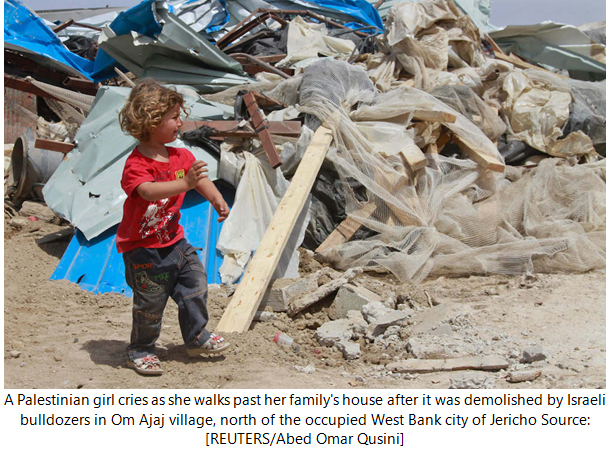 Since 1967, Israeli authorities have demolished over 27,000 Palestinian homes in the occupied territories. The number of illegal Jewish settlers in the occupied Palestinian territories is estimated to be between 600,000 and 750,000. Nearly 42% of West Bank is occupied by Jewish settlers while 86% of East Jerusalem has been earmarked for the Israeli state and for Jewish settlements. Some 420,000 Palestinians live in East Jerusalem along with 200,000 Jewish settlers. Palestinians who live in East Jerusalem are not granted Israeli citizenship. They have “permanent residency” ID cards. Many of them also carry temporary Jordanian passports without a national identification number. Palestinians living in East Jerusalem are treated as foreign immigrants. They are required to fulfil certain requirements to maintain their residency status and live in constant fear of their residency revoked. Since 1967, Israeli authorities have revoked the residency status of over 14,000 Palestinians. 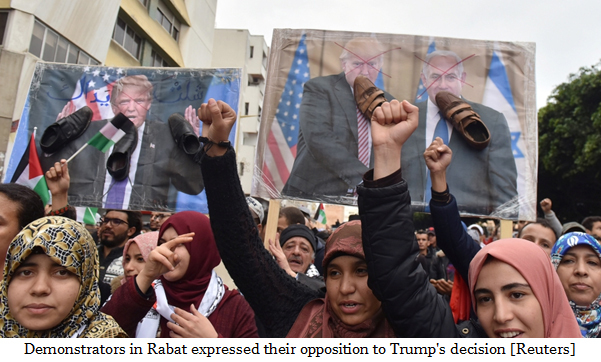 Unfortunately, the response of many Muslim countries, particularly Arab nations, to the US move has been rather tepid and half-hearted, thanks to the pervasive ideological, political and sectarian disunity and dissension in the Muslim world. The extraordinary summit called by OIC in Istanbul was attended by just over 20 heads of Muslim nations. Saudi Arabia, where the headquarters of OIC are located, sent only a senior foreign ministry official. 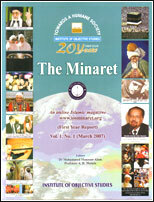 Other Muslim nations, including Egypt, sent only their foreign ministers. It is a matter of shame that Egyptian President Abd al-Fattah al-Sisi is scheduled to meet US Vice President Mike Pence in Cairo the next few days while the leader of Egypt’s Coptic Church, Pope Tawadros II, cancelled an upcoming meeting with Pence, in protest against Washington’s move to make Jerusalem the capital of Israel.